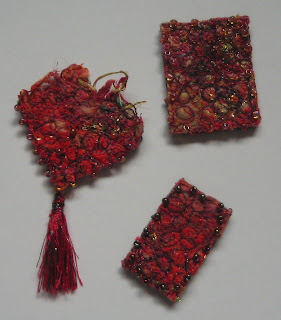 I had some pieces of fabric left over from making the jewellery swap last month for Unlimited Textiles. I was just about to put them in my hoard to save them for that day 'when I know they will come in useful' when I thought why not turn them into brooches. So here is the result. The fan shaped one just had to have a tassel added on to it. When I was photographing them for my blog you can see that Buddy just had to have a look. I could almost hear him thinking "what has she been making now?" As soon as he realised it wasn't food he quickly lost interest. I have finished the 'surprise me' swap for Unlimited Textiles. 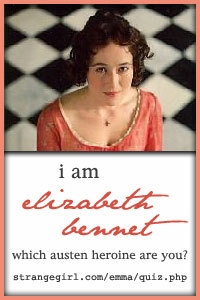 It is a book cover. I have covered a sketch book with it which I hope my swap partner will find useful. I had a lot of fun making this. 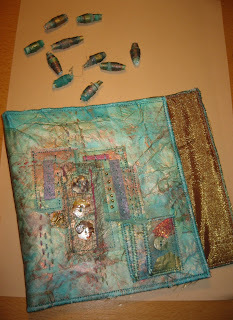 I made fabric paper and dyed it with Koh-i-Noor and rubbed with treasure gold. 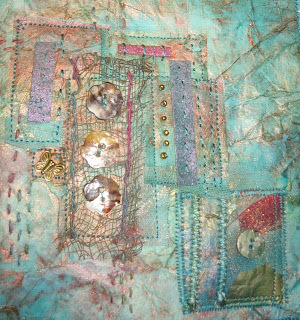 I then embellished the paper with buttons, a charm, hand dyed scrim, machine sewing and hand stitching. I then made machined cords and added hand made beads. I hope my swap partner likes it. This month's swap for Unlimited Textiles is a showcase of what we can do. It is called 'Surprise Me'. We are free to use our favourite technique and make anything we like for our swap partner. Here are a couple of photos of the piece I am working on for my partner. It isn't anywhere near finished yet but hopefully I will be able to show the finished piece by the weekend and it will be on its way to my swap partner next week. Textiles for Two. 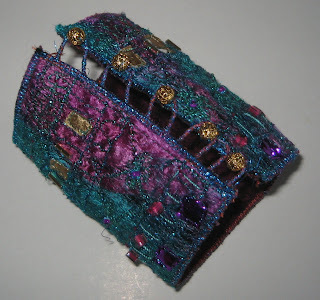 She decided we should make a cuff and the theme we had chosen was Byzantium. This is the work in progress and the first cuff of two that I made. If you wish see both cuffs please visit Textiles for Two. I went to the craft show at Aintree Racecourse last weekend with one of my daughters. As is the norm I spent most of my pennies on my daughter (which I am always very pleased to do) especially as she has now got an interest in a craft. She has expressed a wish to do quilting which has made me very excited at the thought of many happy hours choosing fabric and helping her begin her project. Can't wait! I did actually spend something on myself as I could not resit buying these craft bags to store some of my bits and pieces. My excuse was that it will help tidy my workroom! I just love the colour. 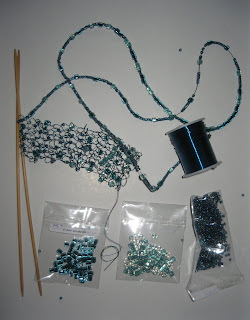 I also bought some wire and beads to knit with. Petrol/Kingfisher blue must be my colour at the moment. This is a little evening bag I made for Textiles for Two. I really had fun making this. 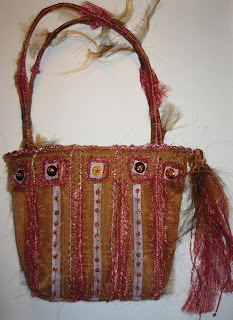 If you would like to see the back of the bag please visit Textiles for Two blog. 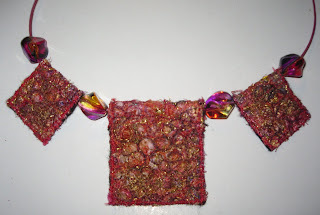 One of the swaps this month for Unlimited Textiles is a piece of jewellery. I have made this necklace and it will be winging its way to my swap partner Chris some time next week. I hope she likes it. I trapped threads and snippets of fabric between water soluble fabric then free machined all over. This is a Flickr badge showing public photos and videos from cellostitcher. Make your own badge here.